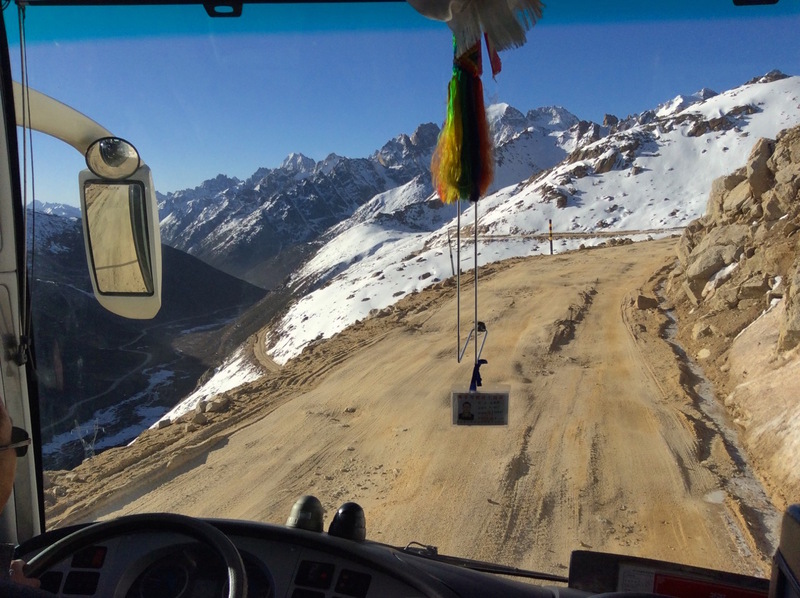 Just after the summit at Chola Pass, Sichuan Province. Resuming our Chinese adventure, we now launch on the legendary (/terrifying?) Chola Pass, currently the only way to the town of Dégé. 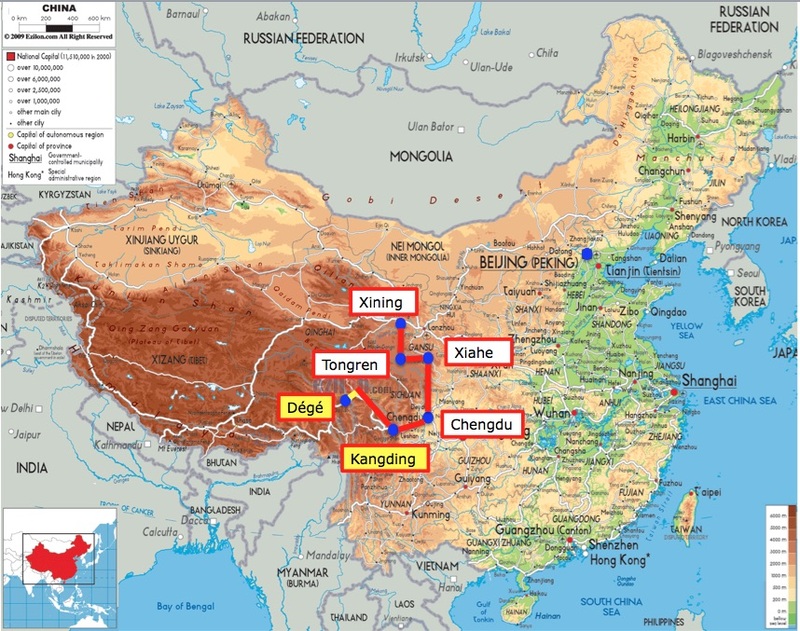 This is the 10th instalment in our 2016 Chinese adventures after Beijing, Xining in the Qinghai province, the Chinese car dealerships of Xining, Tongren, Xiahe in the Gansu province, the mountain road back from Xiahe to Xining, Chengdu in the Sichuan province, Kangding and the Kangding to Dégé road. Chola Pass location: the yellow section just east of Dégé on the map. Chola Mountain is part of a mountain range of the same name, whose highest peak is 6.168 metres high (20.236 ft). 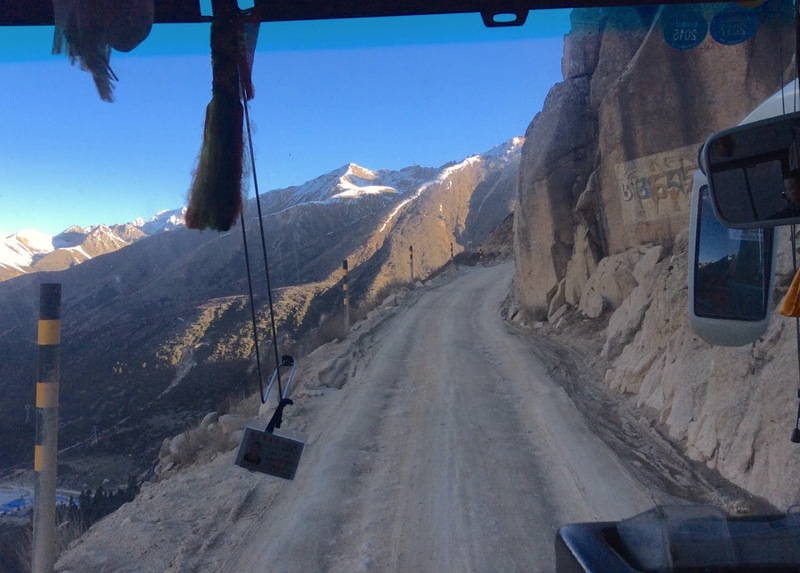 The National Road G-317 climbs the moutain via the Chola Pass, culminating at 5.050 metres (16.568 ft), according to the marking at the Pass. However, my measurements through the Altimeter iPhone altitude app showed a high point of 4.888 metres (16.037 ft), still the highest point on earth I have ever set foot on and higher than the 4.807 metres Mont Blanc, the highest mountain in the whole of Europe. I had the chance / horror to do a return trip on the Mt. 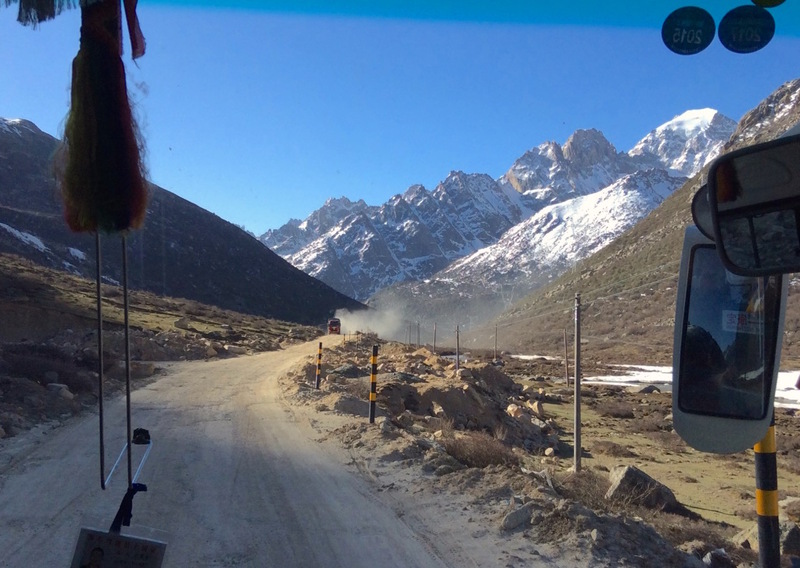 Chola pass, to and from Dégé, at a two-day interval (and with the same bus drivers!). On the way into Dégé it was snowing heavily whereas on the way back the sun was shining bright. This makes for two very distinct sets of photos I will share with you today. The Mt. Chola Pass is a strenuous 1.5 hour ride on a slim and ill-maintained dirt track carved into the mountain side. 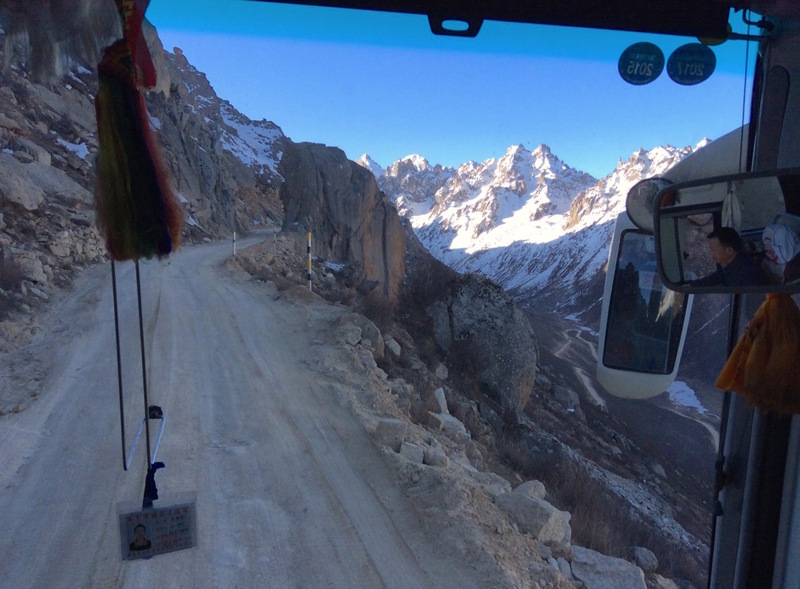 Given it is still the only way to access Dégé from the Sichuan side for now, the full gamut of traffic has no choice but undertake the Pass climb, including heavy and large trucks that manoeuvre precociously inches away from the precipice at each crossing. My intense excitement at climbing the Pass once I read about it on the Lonely Planet China guide quickly morphed into disbelief at how insanely naive I was to want to undertake this trip as soon as the climb started. 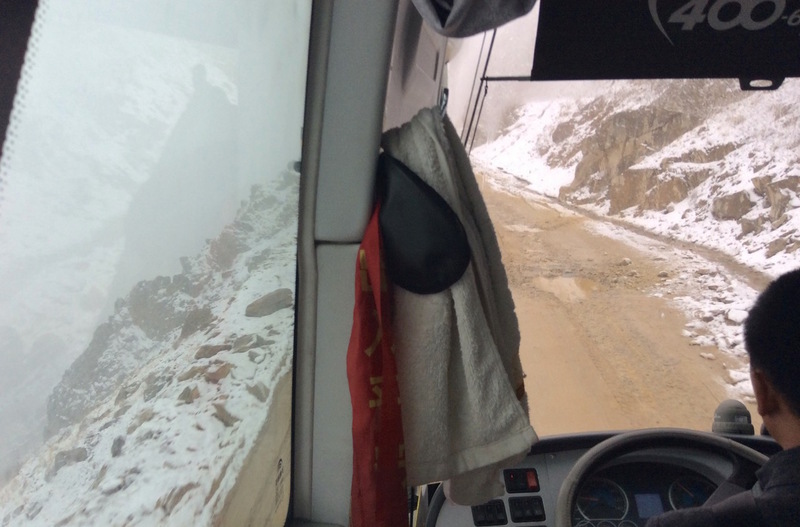 The bus was swaying widely and uncontrollably at each pothole in the track all while the road was becoming more and more slippery with the melted snow and ice that fast accumulated on it during our climb. 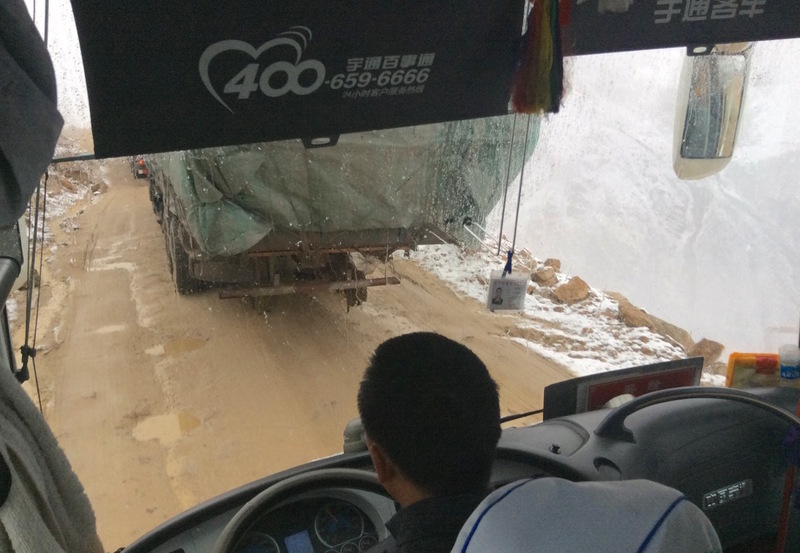 Fortunately, I was sitting just behind the – very experienced – driver and therefore could anticipate almost all movements of the bus as I was intensely checking the track ahead of us. The dirt track got a lot snowier as we descended on the way to Dégé. A departure just after sunrise on a very clear day on the way back offered a much more serene – even if still agitated – experience. The breath-taking panoramas of snowy mountains are worth all the trouble the climb is. 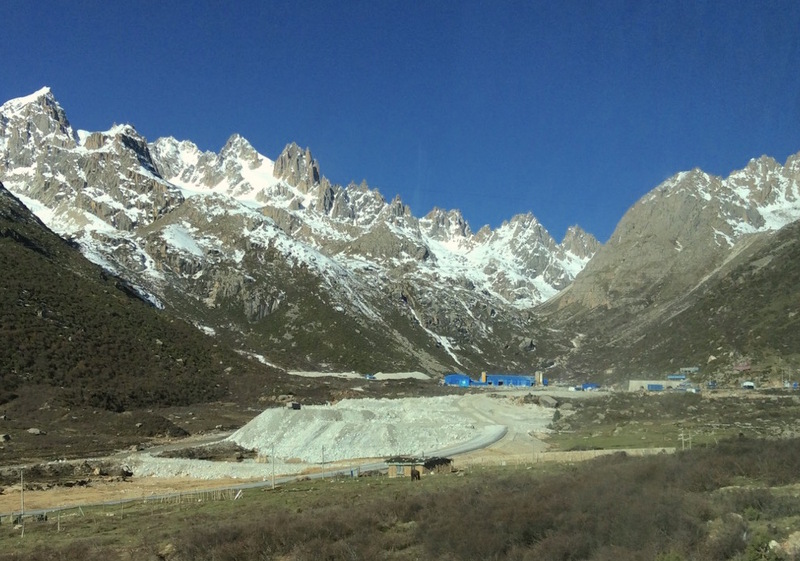 This striking but mandatory experience is about to come to an end though, as a tunnel was nearing the end of its construction at the time I took the Pass (9-11 May 2016). 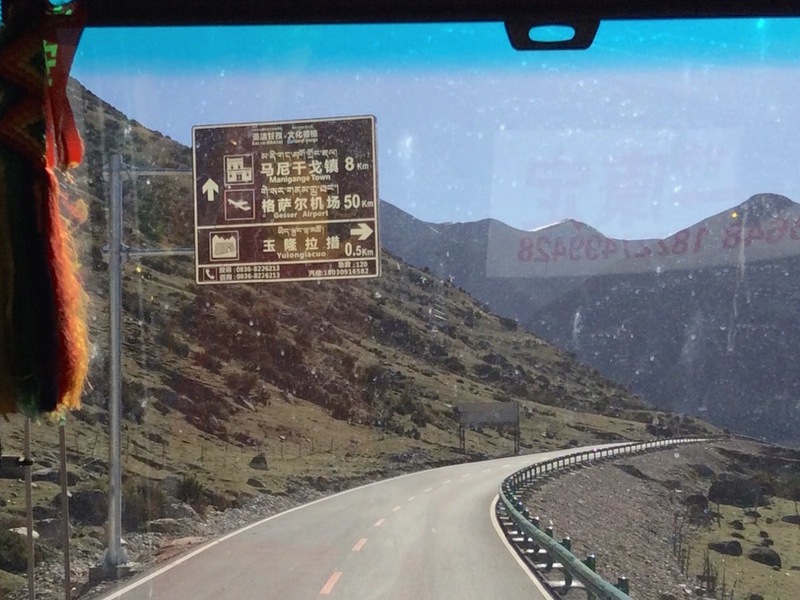 After 90 minutes of high emotion driving, the entire crowd of the bus – all locals as I was the only foreigner, as it has been the case for almost the entirety of this Sichuan adventure – roared in applause when spotting the mouth of the tunnel down the valley (pictured below). Mouth of the Chola tunnel under construction (as of 11 May 2016). Even though still under construction, the nearby Gaesar Airport is already signposted.